"420 people online now, booking trips with Sunway"
Sunway were honoured to receive the prestigious accolade of Best European Sun Tour Operator at the Irish Travel Industry Awards 2018. Thanks again to everyone who nominated and voted, it really does mean the world to continuously be acknowledged for all of the hard work by the whole Sunway Team. Sunway were also thrilled to be the recipients of three awards at the glamorous Irish Travel Trade News Awards at the Clayton Hotel Burlington Road, Dublin 4, on Friday 24th November 2017 - Best Sun Tour Operator, Best Longhaul Tour Operator and Best Agent Friendly Company. These awards recognise and reward excellence in product and service as voted by Irish travel agents from both the North and South of Ireland. Sunway, who have enjoyed a successful few years of winning travel trade awards in a variety of categories were yet again humbled and honoured by the travel trade when they took home the awards for Best Sun Tour Operator and Best Longhaul Tour Operator for the fifth consecutive year in a row. This is the ninth time Sunway have won an Irish Travel trade Award for Best Longhaul Tour Operator and the fifth time for Best Sun Tour Operator. They also were absolutely delighted to win the Best Agent Friendly Company for the third year in a row which was such an achievement and an honour for all the staff to receive. Awards such as these, as voted by their friends and colleagues in the Travel Trade are an excellent accolade to the hard work that the whole team at Sunway put in throughout the year. Sunway, The REAL Package Holiday Company is Ireland’s 100% Irish owned tour operator offering the most comprehensive range of holidays to over 77 destinations worldwide including: Summer and Winter Sun, Worldwide, USA & Canada, Cruise, River Cruise, Sunsail, Neilson, Club Med, Mark Warner, Escorted Tours, Adventure Tours, Weddings & Honeymoons and Lapland. 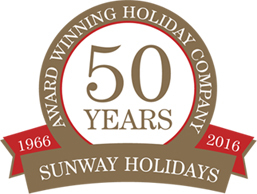 Sunway will be celebrating 53 years in business in 2019 and are proud to provide good value quality holidays at the best price.